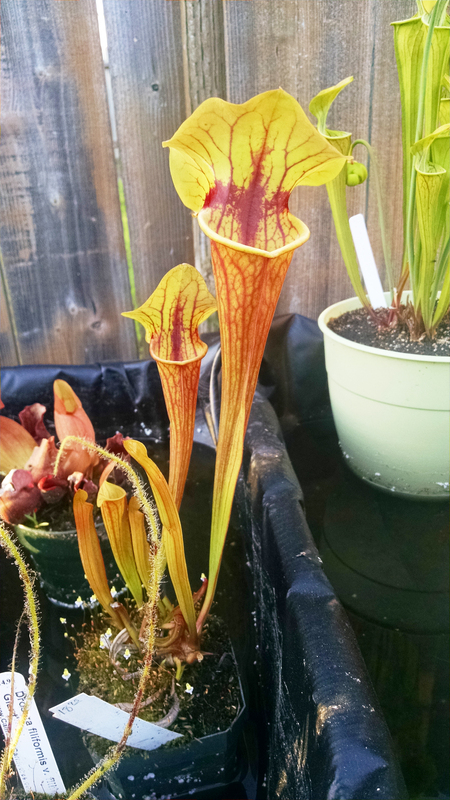 Sarracenia out back |Sundews Etc. It's still early in the season for Sarracenia, but my plants have gotten a bit of a head start, considering that spring arrived in the Bay Area sometime in mid-January. I went out and took some photos in the early evening today, since the diffuse light shows them to much better effect that the glaring sun that they enjoy during the middle of the day. 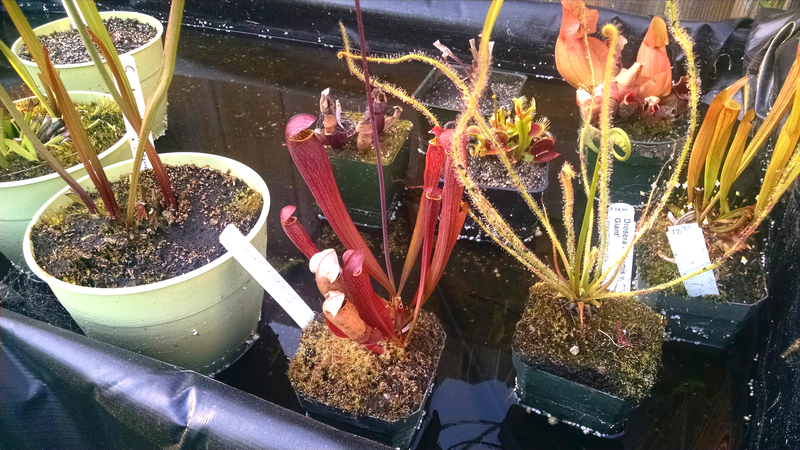 The first thing I want to highlight is Sarracenia 'Red Bug'. I picked this plant up from California Carnivores just under 3 weeks ago, and it is looking great out in the full sun. Check out the tan it's got going. 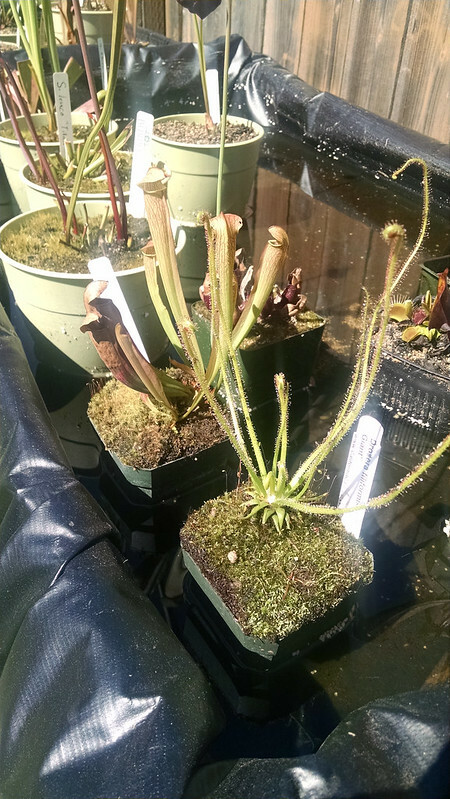 S. 'Red Bug' and Drosera filiformis on March 17th. S. 'Red Bug' on April 2nd. Now I can see why it's got that name. 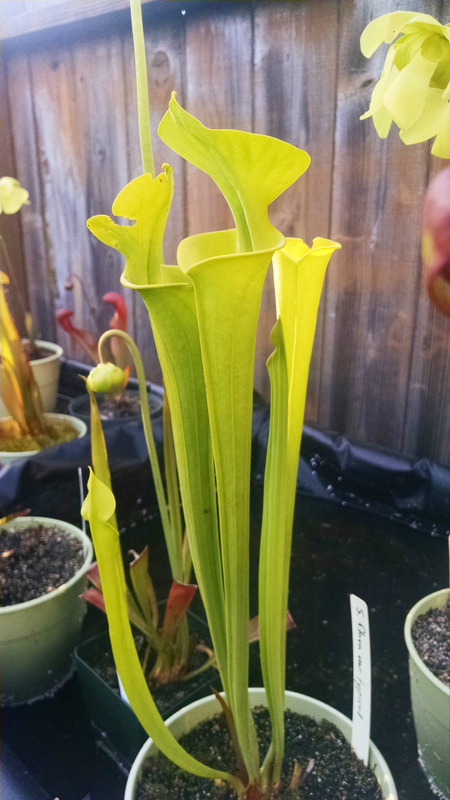 Nearby my Sarracenia 'Abandoned Hope' has popped a couple of big, beautiful pitchers. I love the orange-yellow-red coloring. These are still really fresh too – they should color up even more deeply over the summer. 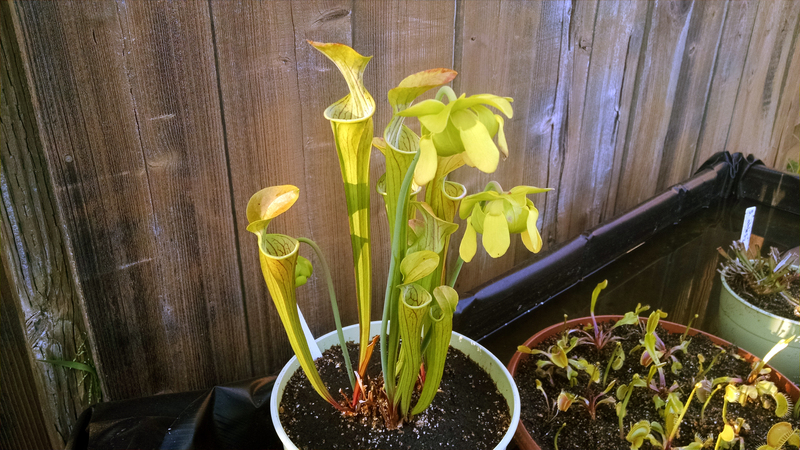 I've finally got a few new pitchers on my poor Sarracenia purpurea that got all torn up by pigeons last year. This was one of my first carnivores. It makes me nostalgic. I love how the new pitchers have this sort of porcelain glow to them – they almost don't look real. It's lit up like a lamp. That would be a cool lamp! This one gets nice and dark orange after a couple of months in the sun too. 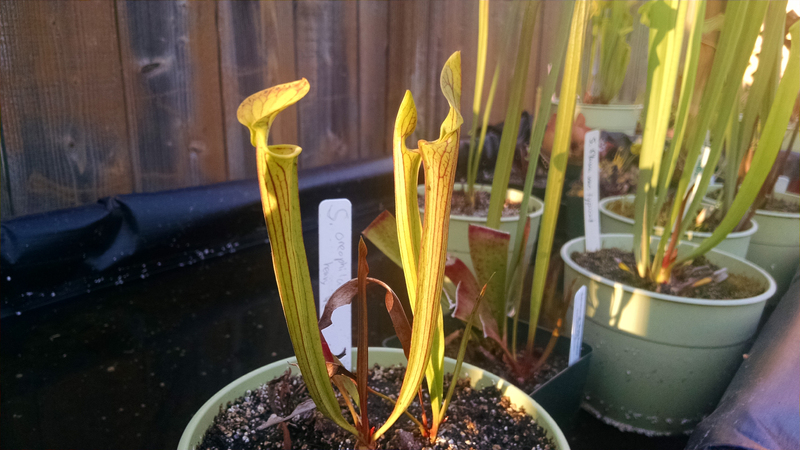 The nearby Sarracenia ×formosa (which is S. psittacina × minor) only has two pitchers so far, but they're developing nicely. "Formosa" means beautiful in Latin. Appropriate! I like the color gradient running down the pitcher tube a lot. 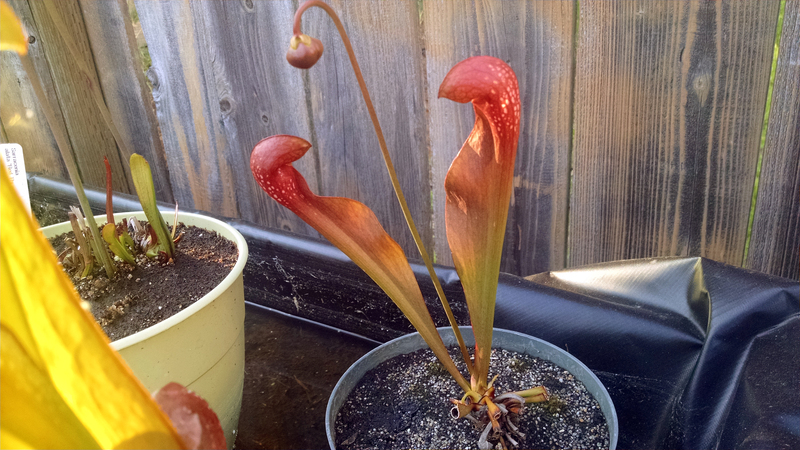 There's a large clump of Sarracenia alata red throat that has 3 big flowers and is just sending up its first pitcher. These flowers are so cute coming up from the rhizomes this way. I'm looking forward to having a big clump of pitchers soon. I received this Sarracenia ×moorei (which is S. flava × leucophylla) as a bonus plant in a trade a couple months ago. I had no idea how it was going to look. Looking pretty nice so far! I'm hoping the colors become more distinct as the season progresses. 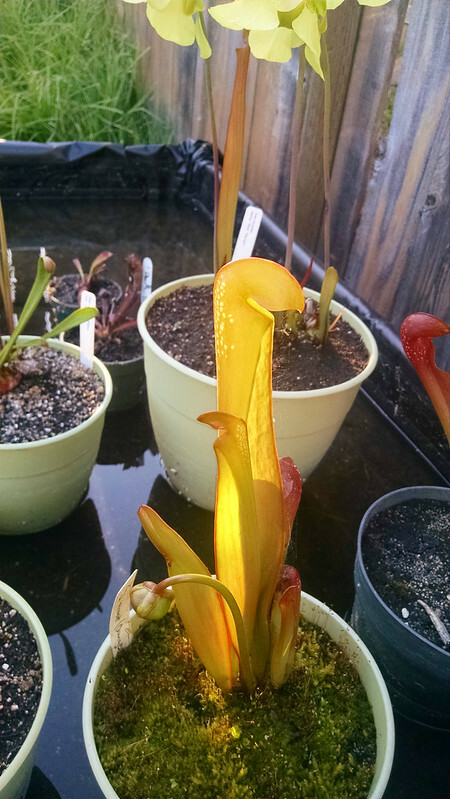 My original Sarracenia flava has essentially no coloring to speak of (though it's not anthocyanin-free). What it does have is some of the most nicely-shaped and proportionate pitchers I've seen anywhere. 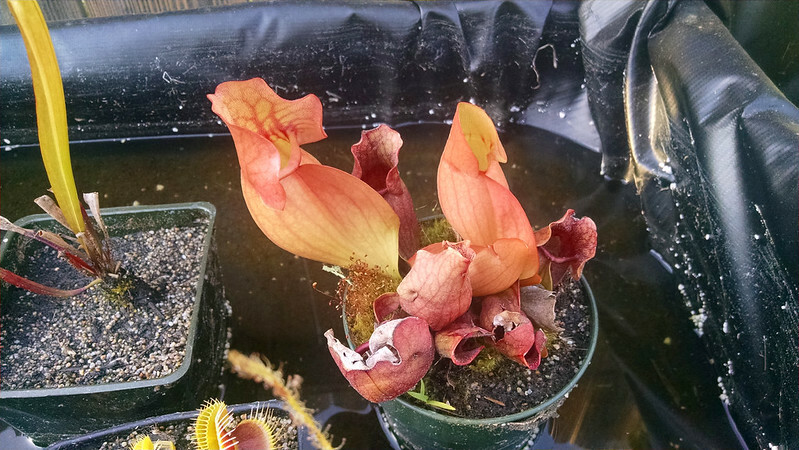 Some of these pitchers are bug-damaged. Darn! Now that is a lovely plant. If my conditions were more controlled I bet I could grow it out into a show-worthy specimen. 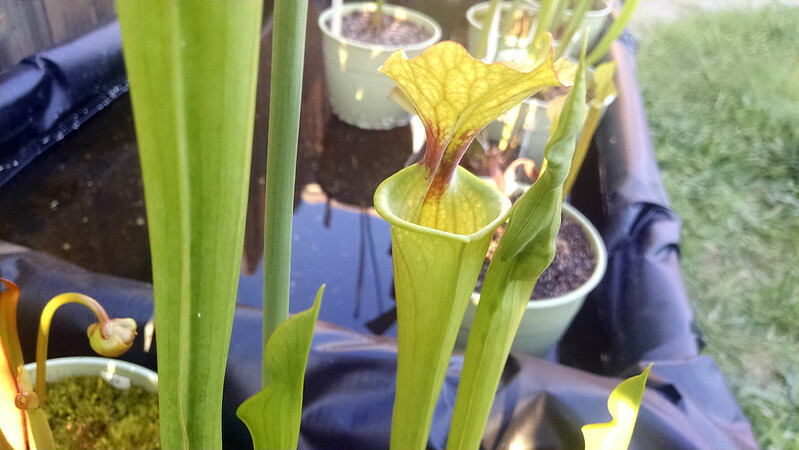 I've got a young Sarracenia oreophila that has some really nice venation going on. Enjoying the last rays of sun. It'll be another year at least before the pitchers are big and mature, but I bet it will look fantastic. Meanwhile my large clump of S. oreophila has the nicest composition of any of my pots outside. A nice little S. oreophila vignette. I'm very excited for the next few months. Really nice Sarrs, Devon! That S. x formosa is really something special! Thanks Maria! And yes, it's one of my favorites. Thanks Julien! And yeah, I think of it as a Sarracenia flava var. 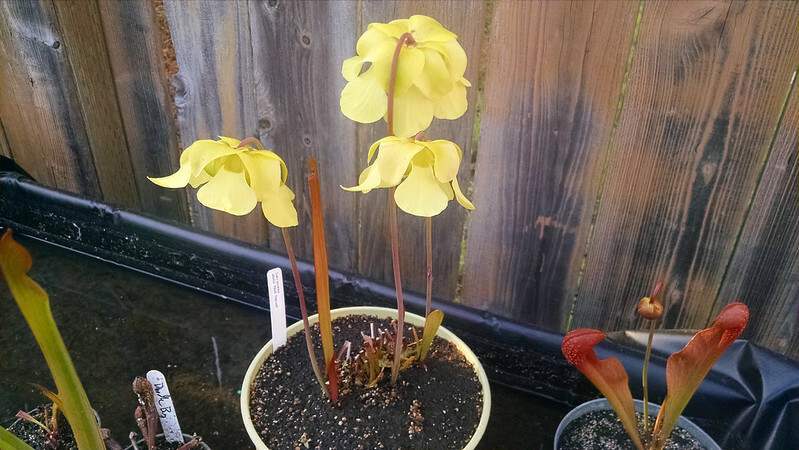 maxima now – I received it before I knew very much about Sarracenia.